We were up at first light and soon after 6am made our way along the now silent main street to Lukla airport to catch the first flight out to Kathmandu. Once inside, now familiar with the drill, we presented first our big packs then our backpacks to be weighed and signed in, then joined the queue wending its way down the stairs – one line for men, another for women. One by one, we were gently but firmly questioned about our bags, where we were from and where we were going, efficiently pat-searched and finally released into the waiting room. The flight itself was sheer privilege – delight tinged with sadness as we watched the majestic ranges of Everest, Langtang and Annapurna appear and slowly recede behind us as we dropped down over the middle hills. The sheer scale and complexity of Nepal’s folded mountain landscape is truly mind-boggling, matched by the capacity of its people to carve out dwellings and livelihoods on steep ridges, narrow valleys and rolling mountain flanks. All too quickly, the scattered dwellings became more frequent and the population denser. Soon we saw the brick kilns of the Kathmandu Valley, interspersed with two- three- and four-story buildings, and suddenly, we were back over the smokey intensity of Kathmandu itself, swooping in to land. 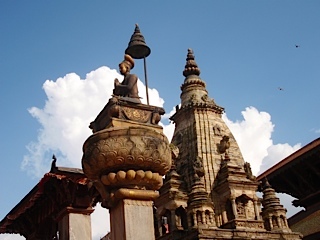 We were efficiently transferred into a waiting bus and driven through town to Bhaktapur, one of the three ancient cities of the Kathmandu Valley. The central town area round Durbar Square is now a world heritage listed site, well deserved as many of its ancient buildings are still entirely intact, with their finely carved dark wooden windows and door-frames. It’s a sheer privilege to spend three nights right in the heart of the old town, any loss of sleep caused by chanting and temple bells in the early hours of the morning amply made up for by sheer delight. There was a busy fruit and vegetable market right outside the hotel, and the daily spiritual practices of Hindu and Buddhist went on every day around the hordes of tourists as they have done for centuries. We had the afternoon off, so after washing my filthiest clothes and leaving them discretely festooned around the sunny roof garden, I set off to explore alone. I didn’t get far, as I’d befriended Saanu the cleaner, and her eldest son Rajan appeared out of nowhere and offered to show me around for free. I’m glad I accepted, for he took me to a Buddhist thangka training school, where he receives an hour’s painting tuition from experienced monks every morning. The father died, leaving Saanu with four boys and a daughter. As the oldest, Raju contributes what money he can earn from guiding tourists and odd jobs. Old King Malla used to visit Kathmandu and decided he wanted Bhaktapur to outshine their Durbar Square. So in the seventeenth century he began the complex of religious buildings that include Buddhist stupas, Hindu temples and South Indian shikaras in a wonderful medley of colours, styles and religions. Beside the tall statue of King Malla is the King’s Bell, for gathering the people to hear royal proclamations; the Army Bell rung each hour by a guard in uniform; and the mysterious Dog Bell. 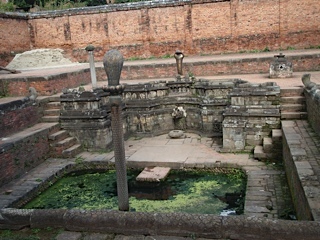 I saw Buddhist places of worship tucked away in quiet courtyards, the edges of a sacrosanct Hindu temple, public baths where people washed (though today’s dubious green surface scum would deter me) and a special pool for the King’s use protected by a large Naga (snake) rearing its resplendent golden head at one end. Raju’s rapid fire tour of Bhaktapur left me breathless, but I was grateful for his genuine enthusiasm, so paid for his trouble and he dropped me back at the hotel. We have arrived back in the Kathmandu Valley in the middle of the Kumari puja and Indra Jatra, so everywhere people are in celebratory mode, with much animated conversation, bell-ringing and general holiday atmosphere. 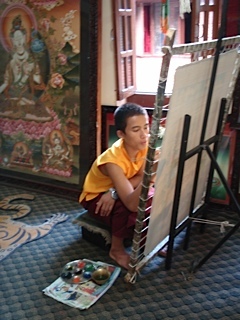 This entry was posted in Activism, Climate change, Environment, Foreign aid and development and tagged activism, AYCC, Bhaktapur, climate change, environment, Nepal by Philippa Rowland. Bookmark the permalink.